The island of Crete is known for its healthy cuisine, based on the Mediterranean diet with pure ingredients like olive oil, legumes, spicy cheese, cretan nut, fish and sweets with honey and meals accompanied by wine and local raki. Traditional dishes served in restaurants are chochlioi, kakkavia, a genuine fish soup, ntakos, gamopilafo, kaltsounia-sweet snack with Cretan honey that will only give you an idea of what the true Cretan cuisine is all about. 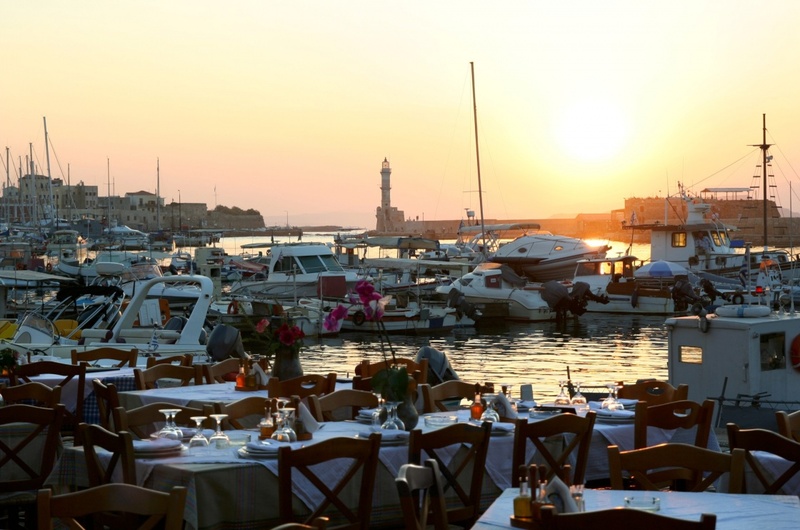 In Chania there are many choices for food, from snack bars that offer you more traditional flavors at very affordable prices to more special and expensive restaurants in exceptional locations with a seaside view and dishes inspired by the European tastes. When in Chania you need to try the exquisite Cretan cuisine that is based on olive oil and all the vegetables and fruits that you can think of as this blessed place is producing so many local products that are introduced to you via the local cuisine. Moreover you will find a number of traditional taverns that have maintained their character through the years serving fresh fish, seafood and other delicacies, at picturesque locations where you may enjoy your meal under the sounds of traditional Greek music and feel more content than ever in your life, next to the sea enjoying romantic moments with your other half. When it comes to restaurants and taverns there is a general rule: try and trust! If you feel like you want to be sure about where you spend your money all you have to do is try the local “meze” meaning the local treat and then be prepared to order the dish. One thing is for sure that Cretans know perfectly well how to please their guests and you will find -at the majority of taverns and restaurants- that they will offer you raki and other delicacies as a welcome gesture. So if you think you have to diet do it before visiting Chania as once you are in Chania you will absolutely love the food and it is more than possible to gain a few pounds and be full in your stomach and your heart!